I was toying with something like Hear No Weevil, but it was just too damn corny! 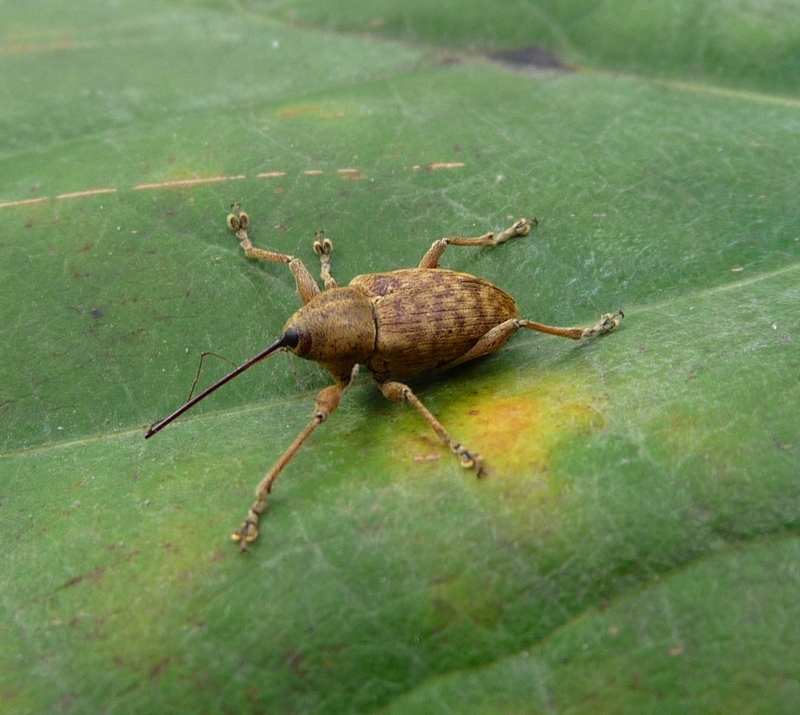 However, this weevil is so cool...I know they are the bane of farmers and foresters, but in the fall we regularly get these acorn weevils around our house and I really enjoy finding them. We have lots of large oaks (red, white and chestnut) around the house, but I'm not sure if this weevil is host specific on any of them, or is simply happy with all of them. The mouth is on the end of the long snout and is used in a drill like way to bore through the acorn shell and get at the meat inside. I'm going to put one under a scope and see what the mouth looks like, I'm betting it is going to be really cool! They also have the antennas on the snout and you can see them in the photo. This weevil is only about 1\4 inch long. Enjoy! This is an amazing site I came here last month and I'm seeing improvement presently keep the good work going and my friends and I will be back soon. Nice website / I hadn't noticed www.bugaddiction.com before in our yahoo Keep up this great work! Chamo-me Paulo,adoro imenso blogues , dou imenso do meu tempo a trabalhar o meu espaço online costumo também editar legendas para vários fóruns,se calhar viram alguma série com legendas feitas por min! E por hoje chega, pois eu trabalho por turnos e tenho de ir dormir umas horas.